Visit the SEKEM project, then enjoy with a cruise up the Nile river with a Dahabeya, a small luxurious & captivating sailing houseboat. 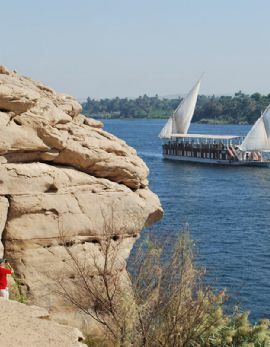 Following the future-bound and inspiring experience at the SEKEM sustainable development project, and the hustle and excitement of Cairo and its sites, enjoy a more relaxing and peaceful journey, sailing up the Nile from Esna to Aswan on an exclusive Dahabeya houseboat (or smaller Sandal houseboat). Indeed, as its name suggests, “golden one" or “the Guilded“, the Dahabeya is a peaceful and luxury experience that instantly transports you to a different era. Thomas Cook (1808-1892) first imitated very rich Egyptian families and “invented” Dahabeya cruises for rich Europeans in the 19th century. 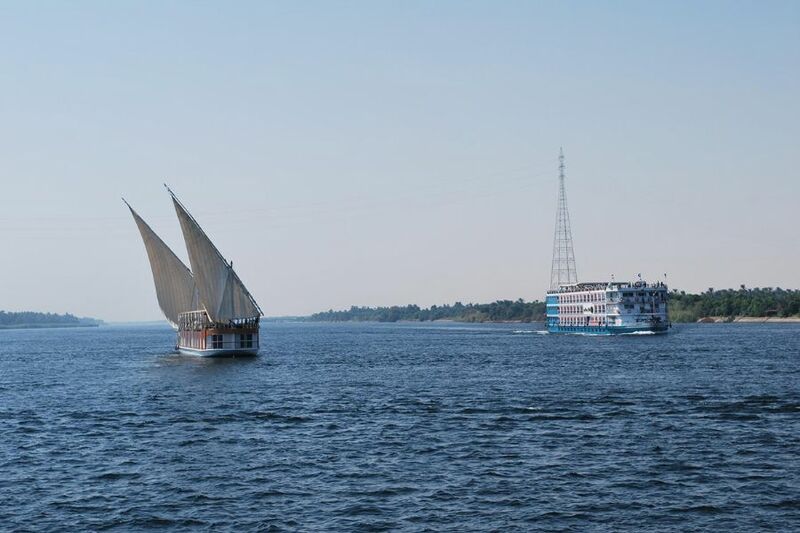 Your journey up the Nile carries you on a fully equipped boat, with full board catering, sun deck area, and cabins with own bathrooms and amenities. Real Dahabeyas – like ours – have no engine, only an electric generator, which occasionally works silently to keep on-board stock cool. This vacation, combining SEKEM and Dahabeya Delight along the legendary Nile river is sure to be one of fulfillment, interest, serenity and enchantment. DAY 1 – Sunday: Flight to Cairo. Transfer from airport to the SEKEM sustainable development project. Welcome and move in to your room. Meal according to your arrival time. DAY 3 – Tuesday: Excursion to the famous and oldest of the 7 Ancient Wonders of the Word, the Giza Pyramids. If time permits, refreshing with a snack at the famous Hotel Mena House (formerly Oberoi) - food and beverages at your own cost. Visit the Pyramids and the Sphinx. Continuing to the Step Pyramid of Sakkara and visit Mastabas with very well preserved wall paintings. Lunch in a shady restaurant (food and beverages at your own cost - by the way much cheaper than at home, about 50-60 USD for the whole week). Back to SEKEM for a relaxing evening dinner. 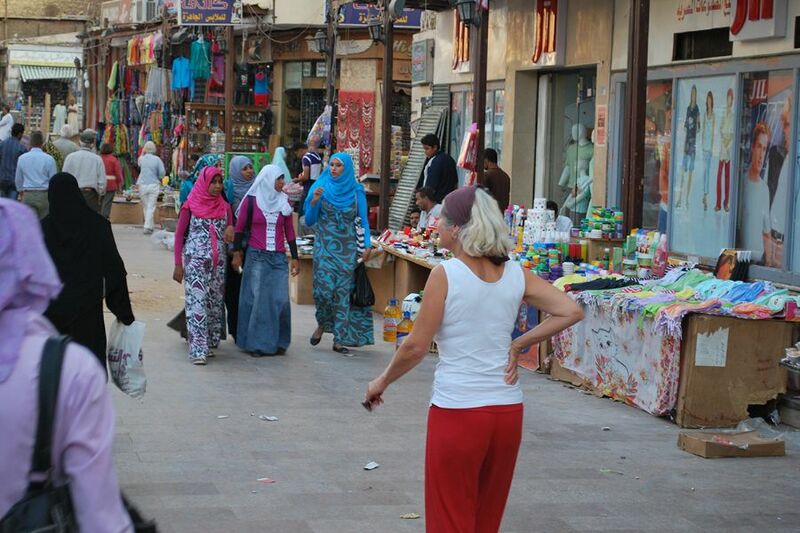 DAY 4 – Wednesday: A relaxed Cairo sightseeing day. Guided tour through the world-famous Egyptian Museum, which is home to an extensive collection of ancient Egyptian antiquities and some of the world's most unique treasures, such as the golden masks of Tutankhamun, Grave Mask of king Amenemope, Mummy mask of Psusennes I, and Figurine of Khufu, mummies, hieroglyphics, among other. Lunch at a nice restaurant (food and beverages at your own cost). After lunch you will have the opportunity to stroll along Cairo’s most famous Basar Khan-el-Khalili, with all the diverse and colourful offers. Accompanied by your guide to be sure the exhibition is not done alone, but the bargaining we leave to you! Dinner awaits for you back at the SEKEM farm. Interesting to note: eating and drinking in Egypt is more than likely much cheaper than your home country. Cost for food/drinks would likely be around 50 euro / 40 GBP / 60 USD for an entire week. DAY 5 – Thursday: Comprehensive guided tour through some production lines of the SEKEM Farm, e.g. the workshops of Naturetex, where hundreds of people are sewing. You will participate at the weekly assembly of the school, where children of many classes show each other and the many ever present visitors what they’re actually learning. Enjoy a nice lunch. At about 4 p.m. you are invited to share in the weekend circle, together with about 800 SEKEM locals/employees, saying farewell to the Abouleish Family. 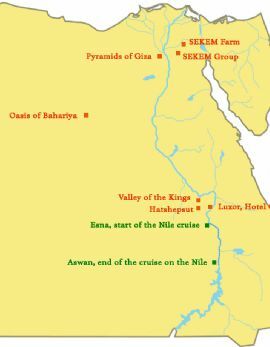 DAY 6 – Friday: Excursion to the Oasis Faiyum, the great garden of Egypt. Lake Karun has been fed by a canal from the Nile for about 3,000 years! You will have lunch at the lakeside residence of Egypt’s last king Faruk (food and beverages at your own cost). Due to frequent refurbishing, the Residence lunch might be in some other nice place in the vicinity. There are many date palm trees and widespread vegetable farms in the valley of Faiyum. You will have a cup of tea in the house of a local farmer cooperating with SEKEM. Simple ball pens and/or bonbons are little gifts much welcomed. Dinner at the SEKEM Farm. DAY 7 – Saturday: After a relaxed breakfast you will drive downtown to visit the Coptic church St. Sergius, where the Holy Family is said to have been resting after their journey from Palestine. Lunch (food and beverages at your own cost). You’ll then visit the most famous of Cairo’s mosques, the Mohammad Ali or Alabaster Mosque. It is an impressive building with wonderful carpets under a huge dome, as well as great panning views of the megalopolis/mega-city that is Cairo. Hereafter, a short visit to Cairo’s oldest mosque Ibn Tulun from 9th Century. Dinner back at the SEKEM farm. 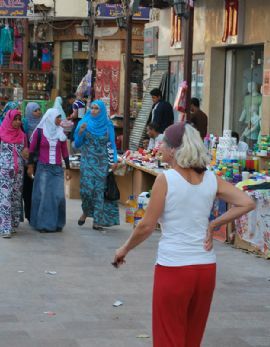 DAY 8 – Sunday: Around noon you will fly to Luxor and stay overnight in the Hotel Gezira Garden. DAY 9 – Monday: After breakfast a vehicle will take you to board the Dahabeya at Esna, about 30 miles south of Luxor. 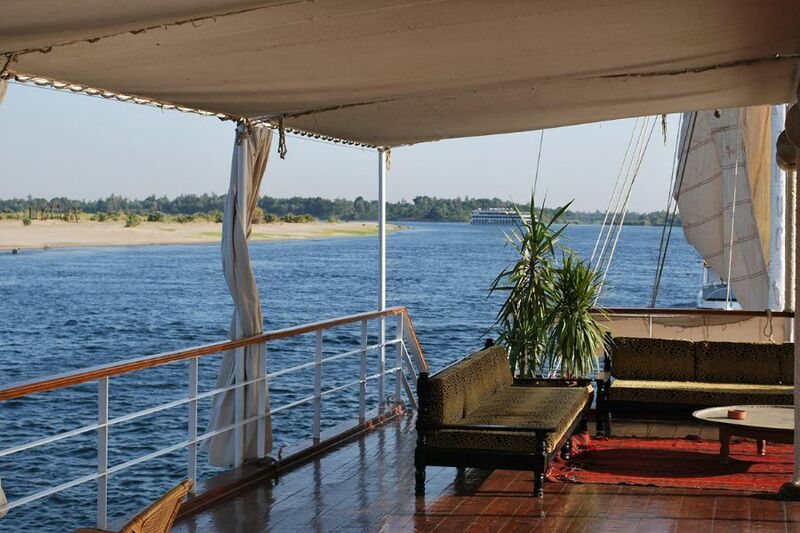 Once aboard you’ll start sailing for the next 6 days (through Saturday) about 130 miles up the Nile towards Aswan. The alternative to the Dahabeya is a Sandal, a smaller, more intimate sailing houseboat that has only 3 cabins for a maximum of 6 guests (minimum booking of 4 participants). 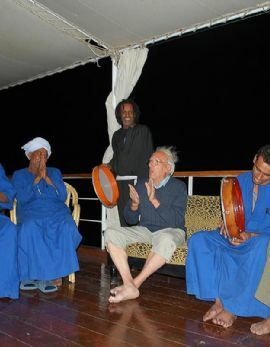 DAY 9-14 - Monday-Saturday: Sailing on a Dahabeya offers a simple, yet luxury pleasure, such as the sound of silent cruising, and of raw nature, the desert wind, and the Nile’s stream. The idyllic views no least spectacular, from the riverbanks, villages, diverse people, to the evening star lights. Relaxation brings on new meaning, uniquely combined with the power and energy of this most ancient journey. Enjoy the time and place pass by whilst reading your book, playing backgammon, or just lazing around and enjoying a local coffee or wine. 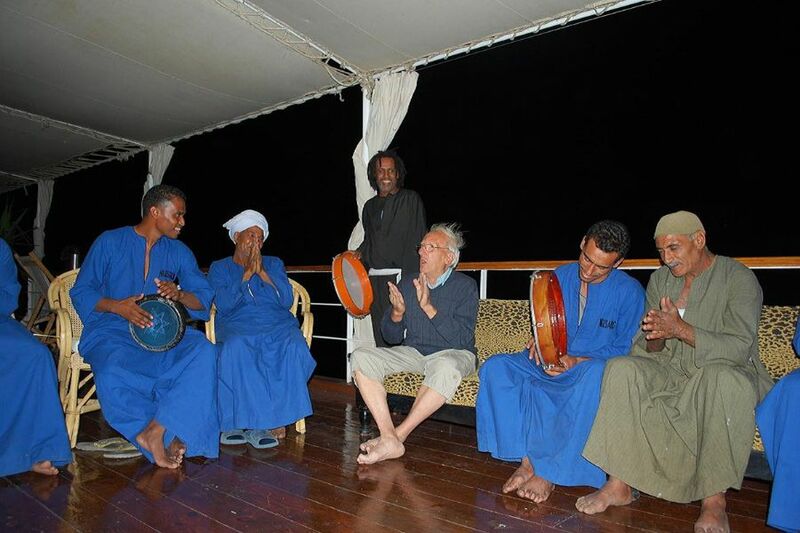 Perhaps you would like to get livelier and join in with the crew's traditional music and dancing. The Dahabeya is driven by the almost always blowing borealis. Since days without wind might occur, a tug boat will help. It then tows about 100 meters away from the Dahabeya so not to disturb with the steam and noise. These ancient sites in Upper Egypt will be visited: El Kab, the Temple of Edfu, the ancient quarries of El Silsila, the Temple KomOmbo, Philae-Temple in Aswan. All entries are to be paid then and there, transfers to El Kab, Edfu, El Silsila and KomOmbo are included, not the one to Philae. The crew will assist with the necessary arrangements. “The Guilded“ or “The Golden“ gives us an impression about how some Egyptian families liked to exhibit their wealth by having guilded (or using real gold) parts of the superstructure of their big sailing ships, that lavishly reflected the sun while passing by on the Nile. 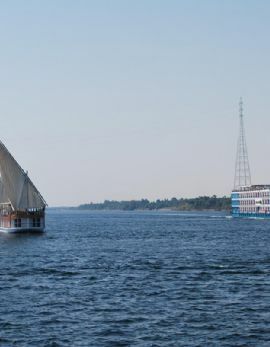 In contrast to the more than 200 hundred steamships cruising the Nile, the authorities restricted Dahabeyas to about 50. This ensures their peace and serenity. No wonder their rates are much higher than the ones on Diesel-engine driven steamships. Dahabeyas sail and moor at small isles in the Nile or at an interesting riverbank, where steamships cannot, and are not allowed to moor. The said mentioned Dahabeyas belong to Alaa Hassan (Luxor) and Jane Irving (Yorkshire). The Dahabeya sailing houseboat offers 10/16 beds in 4/6 DBL-Cabins and larger Suites at the stern. All cabins have a separate bathroom with WC, shower and basin, as well as a cosy bedroom with single beds that can be pushed to a DBL bed. 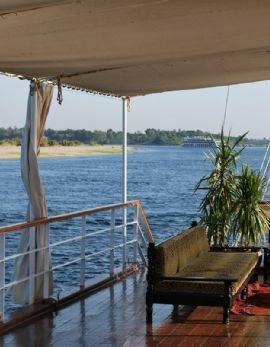 The suites are larger and have a view from the stern of the boat across the Nile. 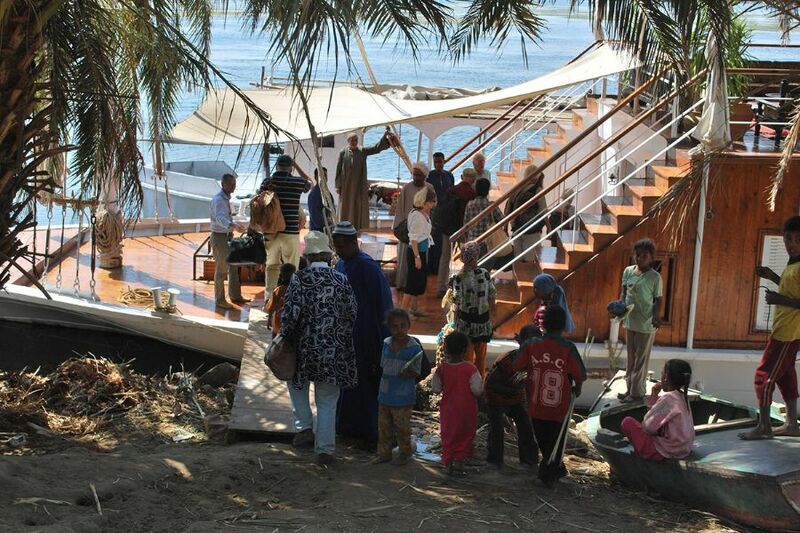 The Dahabeya has a beautiful saloon with comfortable seating, dining/common room, and a wide sun deck. The deck can be protected from wind and sun by encircling curtains. Ample seating-accommodation can be arranged as you please. Cabins, and the boat in general is decorated with authentic oriental furniture. Al meals are freshly prepared by the cook on-board, with produce bought daily at village markets along the Nile riverbanks. Meals are delicious, fusing all the local colours and aromas. Cold non-alcoholic beverages are included, e.g. freshly made lemon-juice, and tea and coffee (or bring your own also). No better way to experience the destination than in its food, in the fresh morning watching the sunrise and silky Nile, in the shade during the hot days, or in the evening under the stars. The crew will provide alcool, if wanted. 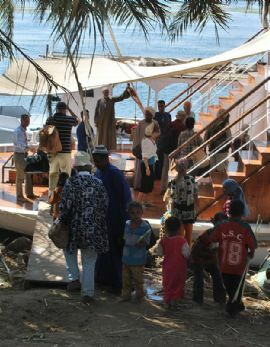 DAY 14 - Saturday: Transfer from the Dahabeya sailing boat to Aswan International Airport for flight home via Cairo. What's Included: Flight with renowned airlines from international EU-airports to Cairo, connecting flights upon request. All domestic flights and transfers included. 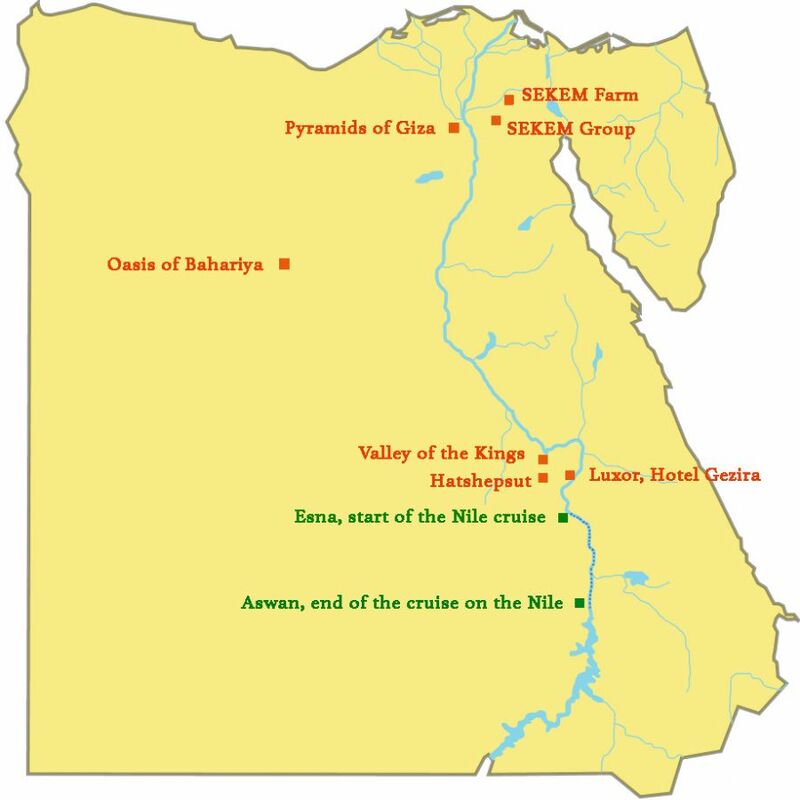 8 days at SEKEM as described in itinerary, 1 × B&B overnight in Luxor, 6 days Dahabeya (*resp. Sandal) Esna-Aswan. Full Board incl. lemon juice, coffee, tea. Sights as described in the itinerary of this tour/vacation. What's not Included: Flights from other than the above mentioned Airports. SEKEM Reisen can help book flights from/to any other Intl. Airport you wish to depart/return to. We will book the flights with renowned airlines, in close coordination with you, preferring direct flights at decent times or flights with the least stops possible. The service charge for such bookings will be 5%. 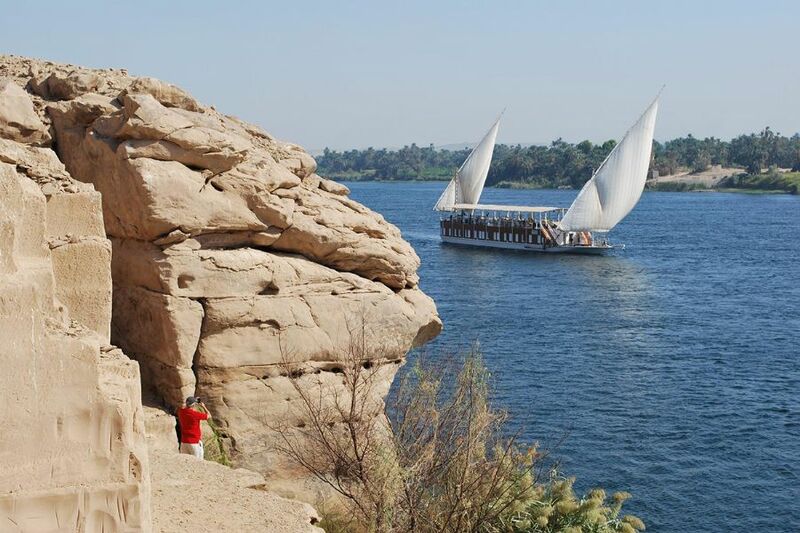 Entrance fees to sights during the Nile sailing, except Philae. SEKEM provides accommodation for visitors, with fully equipped rooms. The 33 rooms available at the farm are all Double Rooms, with 2 having adjacent doors, ideal for families, or helpers. All rooms have a bathroom with shower and WC, as well as mosquito nets. Rooms are either on the ground level or first floor, looking out to the lawns and gardens in front and behind the building. The Dahabeya sailing houseboat offers 10/16 beds in 4/6 DBL-Cabins and larger Suites at the stern. All cabins have a separate bathroom with WC, shower and basin, as well as a cosy bedroom with single beds that can be pushed to a DBL bed. 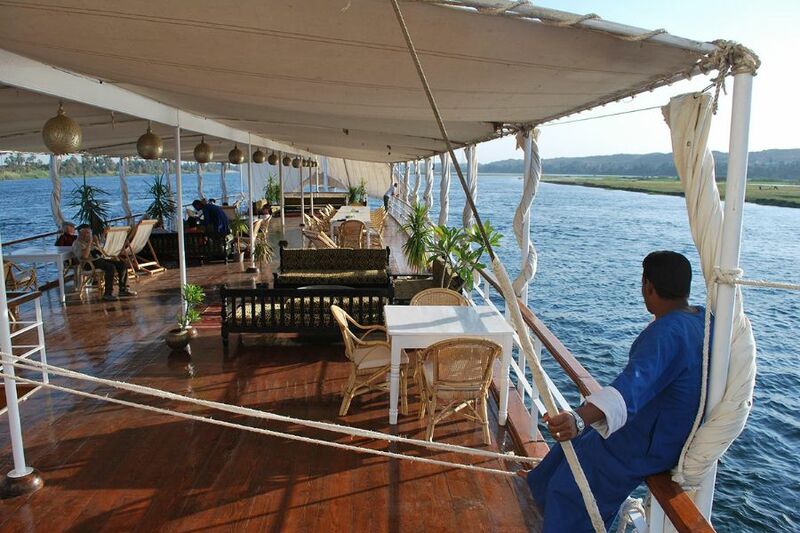 The suites are larger and have a view from the stern of the boat across the Nile. 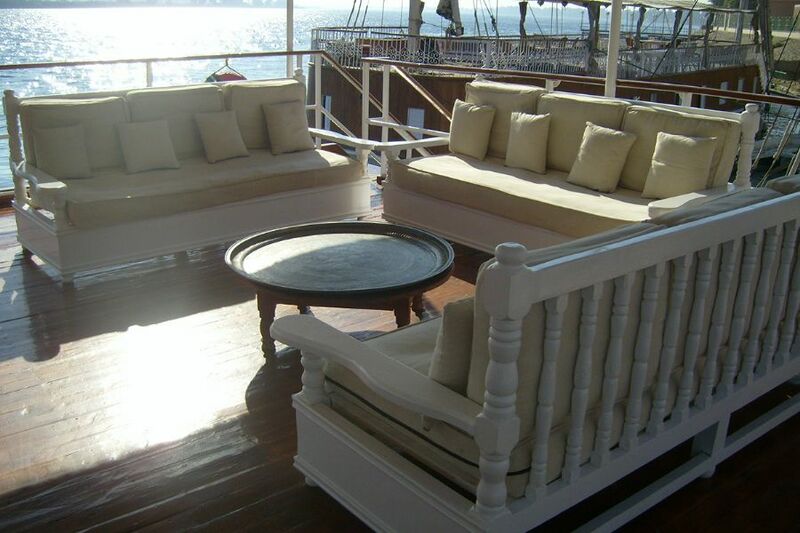 The Dahabeya has a beautiful saloon with comfortable seating, dining/common room, and a wide sun deck. The deck can be protected from wind and sun by encircling curtains. Ample seating-accommodation can be arranged as you please. 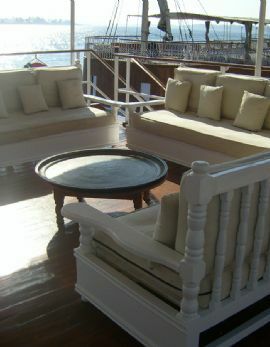 Cabins, and the boat in general are decorated with authentic oriental furniture. 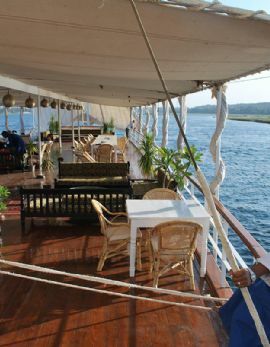 Similar to the Dahabeya, the Sandal is a smaller, more intimate sailing houseboat for the Nile, with only 3 cabins for a maximum of 6 guests (minimum booking of 4 participants). Travel insurance is always advisable. To arrange it speak with SEKEM Reisen for more information, or book itself yourself directly using the below link. SGL in DBL-Cabin 2,880 euro pp - Suite: 2 persons + 90 euro pp extra, 1 Person + 180 euro pp extra.